I knew it was going to be awkward to watch, and it was. The hype, the anticipation, the anxiety. 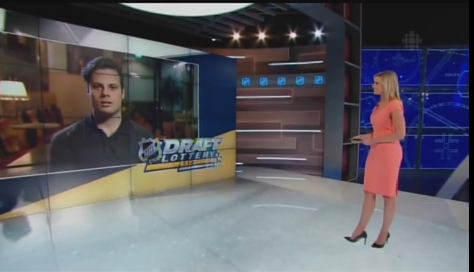 It all game to a head on Saturday night with the long-awaited 2016 NHL draft lottery. Turning a not-made-for-TV event into a TV event is never a great formula but this was always going to be a ratings bonanza regardless given what was at stake, especially in Canada. While ratings show that hockey fans north of the border have been spending more time working in the garden than watching playoff hockey, you knew everybody was going to be gathered around the living room and watching CBC on this night to find out where their team was going to end up picking in the first round of the 2016 NHL Draft. With all seven Canadian teams finishing in the bottom dozen of the NHL's overall standings, this was this year's Hockey Day in Canada. It was a day that had the potential to instantly turn around a team's fortunes, to fast-track a rebuild, all in the time it takes Bill Daly to flip over a square piece of foamcore. Predictably, there were plenty of painful-to-watch moments. Before the lottery began, there was the obligatory interview with expected first overall pick Auston Matthews, who was not on hand because he was training in Finland. This one made even worse by an excruciatingly long time delay each time co-host Kathryn Tappen finished asking a question and before Matthews would begin his response. Repeated occurrences of dead air on national TV. Awesome. Perhaps it was a bad Skype connection, or maybe it was as simple as Matthews dozing off in between as it was just after 3 a.m. in Helsinki, after all. Then we had 14 representatives from the 14 non-playoff teams perched in these staggered chairs, resembling pieces on a giant chess board. Fittingly, 11 would turn out to be pawns in the manufactured drama. Personally, I thought it had a bit of a Goodfellas feel to it. GM Fellas? Then there was co-host Daren Millard with a wee bit of a geographic blunder. Less than 60 seconds after revealing the Senators with pick No. 12, he gets to the Canadiens pick and declares, "At No. 9, the first Canadian club, Montreal." Pardon? Sorry Ottawa, have you not heard the news? You're no longer part of Canada. But the good news is your odds of making the Stanley Cup playoffs next season just went up drastically. As they continued to count down the teams and there continued to be no variance from the order in the standings, it became increasingly apparent that Calgary was not going to drop to eight. This was good news for the team. But was that news about to become even better? When Arizona was revealed at No. 7, excitement in Flames nation was really starting to build as maybe, just maybe, that coveted top three pick -- and first top-three pick since the Flames have been in Calgary -- would come to fruition. But alas, it wasn't to be. When Daly did the reveal at No. 6, it was not the Winnipeg Jets logo that appeared as the team slotted in that spot, it was the Flaming C.
Insert sad trombone sound here. So while there was was instantly jubilation on Portage and Main, there was cursing all along 17th Avenue. The consolation prize for Flames fans was the anguish in Northern Alberta less than a minute later with the reveal that the Oilers had fallen two spots to No. 4. While that 1-in-4 chance at finishing top three was obviously the outcome the Flames organization and fans were really hoping for, the outcome of Toronto, Winnipeg and Columbus as the lottery winners and being awarded picks 1, 2 and 3, was not a bad alternate outcome in the grand scheme. 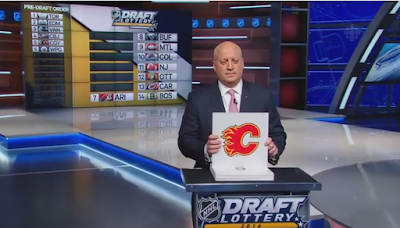 In fact, I'd suggest that all possibilities considered, the draft lottery turned out pretty well for the Flames. The odds of dropping three spots was remote at 3.7 percent. It would require three teams above them in the standings to win the lottery and jump ahead of Calgary in the selection order. Yet with the possibility that could happen, I could sense some nervousness from Flames management. From Friday when I talked with Brad Treliving. "I've tried to spend most of my time looking bottom-up. Plan for where you could be at eight and go from there," said the Flames GM. "Right now, you're just running through the eight names. Or, sometimes I come up with seven and kinda stop there." It feels like dropping three spots would have been an awful outcome. Dropping to seventh, which there was a 25.5 percent chance, would have been frustrating too. In the end, avoiding both of those outcomes merits a collective sigh of relief. Going into the lottery, Treliving talked about ledges. He said that as the team saw it, there was a line after the top three. No surprise there. Matthews and the fantastic Finns really separated themselves from the pack. "Then after six, I've got another line there," he said. "Then there's seven and there might be a little bit of a drop to eight." In other words, don't drop any further than one spot and you're getting a player from that second tier. That's exactly how it worked out too. Oilers end up at No. 4, the Canucks at No. 5 and then the Flames at No. 6. The consensus second tier is comprised of three wingers -- big port siders Matthew Tkachuk (London, OHL) and Pierre-Luc Dubois (Cape Breton, QMJHL), along with the skilled Alexander Nylander (Mississauga, OHL) who plays on the right side. Nylander was born in Calgary while his dad Michael was playing for the Flames in the late 90s. As for what order you'd rank those three, I've seen every combination. If the Flames list resembles that, they're looking at a winger that could score and that's a positional need. There are no centres in there and that's OK, Calgary is well stocked up the middle right now with Sean Monahan, Mikael Backlund and Sam Bennett. The worst outcome for Calgary would have been their three Pacific peers Edmonton, Vancouver and Arizona -- in some order -- ending up with the top three picks. It wasn't that much of a longshot either considering the Oilers (29th) and Canucks (28th) started in the bottom three. Three elite talents all ready to step into the NHL next season, all ending up in your division, that would have been a disaster. Instead, none of them ended up in the Pacific with the Atlantic, Metropolitan and Central divisions getting one each. The Oilers, Canucks and Coyotes all have loads of young talent and adding an adrenaline shot like Matthews, Patrik Laine or Jesse Puljujarvi would have made Calgary's uphill climb to make the playoffs a little steeper. Instead, Edmonton and Vancouver drift out of that top three into that next tier of further-out prospects that naturally come with more uncertainty. Each team could still end up with star players, same with Arizona at No. 7, but they're not going to have one land in their lap gift-wrapped as would have been the case had they been one of the three teams to win the lottery. Now the onus is on each team, Calgary included, to make the right decision when their pick comes. With the four Pacific teams slated to pick in order from 4-7, this will be a fascinating draft year to look back on in the years to come. Who got their pick right, who didn't. "Once you get to four, things could fall different ways as different teams have different guys at No. 4," said Treliving. While many have Dubois, Tkachuk and Nylander as the next three, Craig Button added a new wrinkle with his latest mock draft on TSN right after the lottery as he has the Canucks taking hulking 6-foot-6 centre Logan Brown (Windsor, OHL) at No. 5. So there's another new name that could cloud that 4, 5, 6 conversation. Further to that, no one should be stunned if Edmonton or Vancouver grabbed a defenceman. While Jakob Chychrun (Sarnia, OHL) was the top ranked blueliner for much of the year, there seems to be some volatility with this player. Seems some teams don't regard him nearly as high as others like Olli Juolevi (London, OHL) and Mikhail Sergachev (Windsor, OHL) . Treliving said once you get into the defencemen, preferences seem to be all over the map. "It's unique that if you talk to 10 people, you might get 10 different names in terms of a consensus top defenceman. They have different attributes, different traits. Once you get into that 6, 7, 8 range, there's going to be lots and lots of debate." It's all good news for the Flames as the more variance there is, the better the likelihood that on Calgary's 4-6 list Treliving referred to, they could get their No. 4 ranked player. With Bennett plucked with 4th pick two years ago, that wouldn't be a bad outcome. One of the age-old debates when you talk about the draft is do you always take the best player available or do you address a positional need. At No. 6, the Flames should be in a position to do both. Address a position they need while also taking the best player available. Had Calgary fallen to No. 8, then things become a bit more uncertain. If that next tier of wingers are all off the board by then, you could be looking at a defenceman as the best player available yet is that the right move for Calgary? Given Mark Giordano, TJ Brodie and Dougie Hamilton are locked up for a long time, the arrival of Jyrki Jokipakka, the emergence of Tyler Wotherspoon and Brett Kulak and with Rasmus Andersson, Oliver Kylington and Brandon Hickey in the pipeline too, I think the Flames have other more glaring needs. But if the best of what you need is gone, then you're in a bit of a conundrum. There are still eight weeks to go until the NHL Draft in Buffalo. But now that there's certainty to the draft order, the prospect talk is really going to heat up. "Once you have the draft order, then you can start narrowing the scope. Then you can start having dialogue and can get a sense of where everybody is at," said Treliving. That includes more than just the first round too. "It's like every year, somebody is going to be taken in the 4th round that's going to be a helluva player. Let's find out who he is and get him." The Flames GM describes this year's draft as not as deep as a year ago, which puts added pressure on finding the best players. "It's an interesting draft. Every draft, you have to go and find players, but we knew going into last year's draft that when we were in the second round, there was going to be some really attractive names," said Treliving. "Talking to our staff, this draft isn't necessarily as deep. As there certain names we really like? Sure, absolutely. But it's probably not as deep as it was a year ago." Early indications are that the Flames did very well last June in finding some diamonds in the rough. Rasmus Andersson at No. 53 is looking good. Oliver Kylington at No. 60 could be a steal. Andrew Mangiapane at No. 166 is coming off another phenomenal junior year. On a team in which it's co-MVPs for the season, Johnny Gaudreau and TJ Brodie, were both fourth round picks, Calgary is certainly as familiar as any team with the reality that the back ends of drafts can be a great way to salvage a draft in which you stumble with your early picks. This is the part where as a fan, you cross your fingers and hope this isn't a year where they'll need to hit on late round picks to salvage the draft. But we won't know that answer for many years. Looking for the Dlames to trade up to Number 2 or 3 with all the D prospects we have.